I thought I was done making orange beads but I forgot that I plan to make a bunch of square chip beads and what do you know, the first color I picked up was orange. Actually, these are more coral in color than orange. 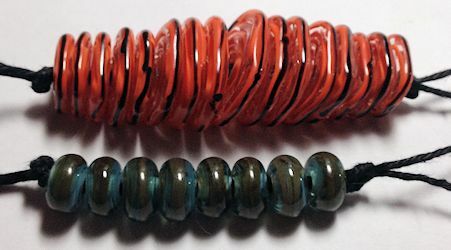 The other spacer beads are veiled cane. It’s a weird combination, tobacco and opal blue. I think it’s supposed to look like water and rocks and probably looks better on larger beads. on March 22, 2014 at 12:50 pm Comments Off on Well, I Lied….